This image is still considered BETA and discussed in the Wiki: http://digistump.com/board/index.php/topic,1211.0.html In the very first thread there is always the most recent PDF linked. All users are encouraged to give feedback! This table is a first overview of all the pins of the digiX. 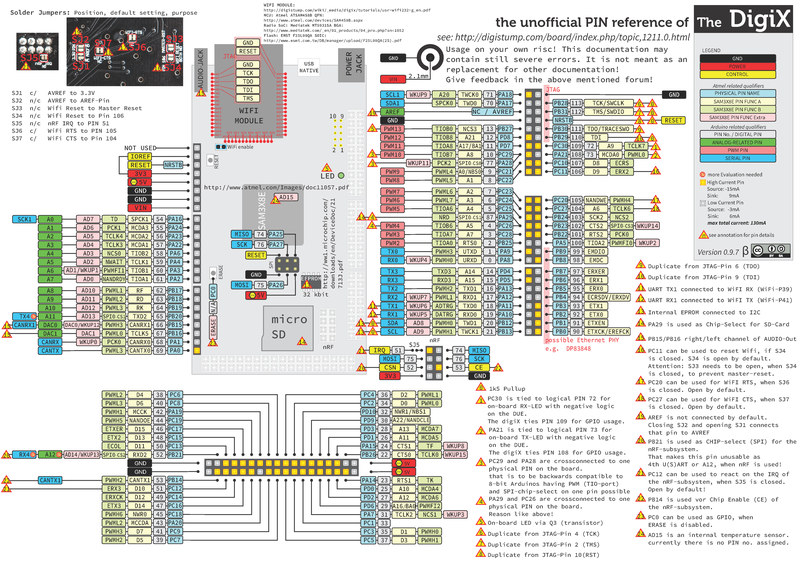 The first 5 columns are referring to the Atmel reference: the Pin-Number of the physical pin, the Pin-Name, the Pin-Function of Periphery A and B, as well as extra functions. The next columns are the Pin numbers of Due/digiX and the Names, followed by columns, where special functionality is mentioned. 131 PC20 NANDWE PWMH4 105 wifi flow control ? 132 PC21 A0/NBS0 PWML4 9 D9 IRDA TX ? 138 PC27 A6 TCLK6 104 wifi flow control ?